Title card of the series. 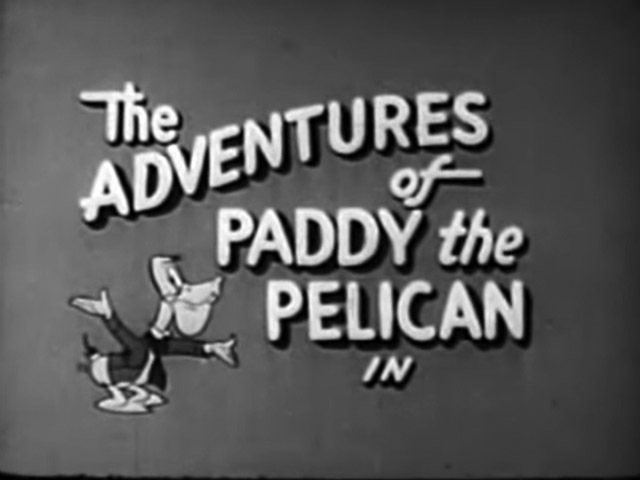 The Adventures of Paddy the Pelican is one of the first made-for-television cartoons from 1950 that aired on Chicago's WENR-TV (now WLS-TV).< This animated series was created by Sam Singer. It originally debuted in the US. The series is about a pelican and his adventures with friends. It's notoriously considered among the worst cartoons of all time. This is thanks to the obviously low production budget, which led to its characteristic pencil sketch animation, dark backgrounds, looping sequences, and poor lip syncing. Only six episodes of the series were made, and every episode has been available online since October 2016. The show was originally created as a puppet show. Any recordings of the puppet show are lost. Sam Singer also made a comic book series for Paddy the Pelican. These comics are also lost today.